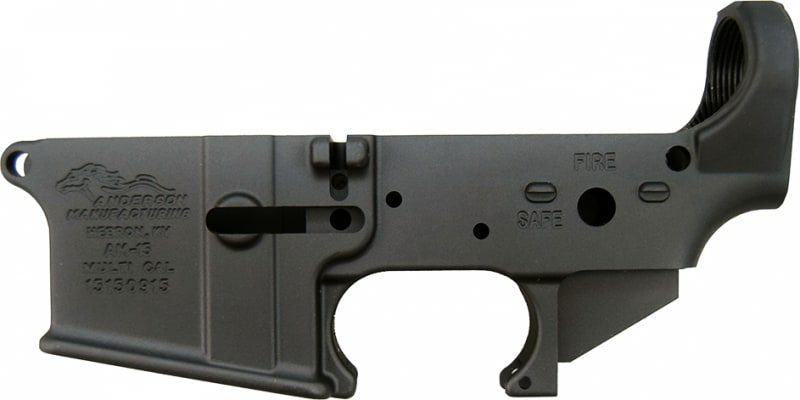 The ATI AR-15 Omni Hybrid Stripped Lower Receiver accepts all standard AR-15 barrels and lower parts. Manufactured out of polymer and reinforced with metal, this receiver is light but durable. Watch Ben's Video On Our ATI AR-15's Here. As a home builder myself I love these lowers, they are tough as nails, scratch resistant, user friendly, and best of all you don't have to worry about finishing the receiver to match your rifle. 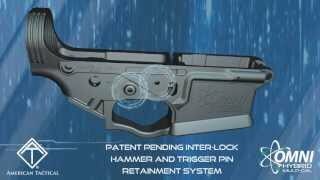 Drop in design and all standard AR-15 lower parts not only fit but in many cases work far better with this receiver than others due to ATI's Patented Inter-lock hammer and trigger pin retainment system which stabilizes and prevents movement from the hammer and trigger pins during firing. 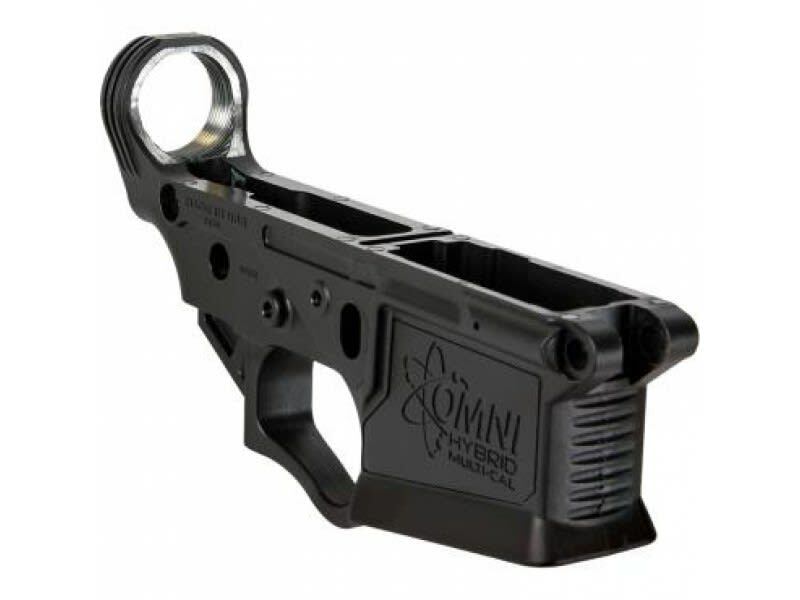 The Omni Hybrid Multi-Cal AR-15 lower receiver is the perfect combination of strength and durability. Tested and rated to be as strong as a billet receiver, the new design provides extra strength in the high pressure sections and is designed to surpass the military pressure and weight bearing testing. Primarily used for building .223/5.56 rifles but receiver is marked as Multi Caliber so ideal for use for 7.62x39, .300 B/O ... etc. builds. Some folks have an aversion to these receivers due to the polymer coating.My opinion is exactly the opposite. If you look closely at our image you can see the steel frame in the forward threaded portion of the receiver. It truly has the strength of a Billet Lower, with the toughness and corrosion resistance of the best polymer blend available. Each receiver carries A.T.I. 's Limited Lifetime Warranty. If nothing else, get a few of these and set them back, in this climate they are not only a great deal, but a great investment. Watch The Drop Test Video Here! In this test they took an American Tactical OMNI HYBRID lower and paired it with a 5.56 upper receiver, and performed a drop test, similar to the test H.P. White Laboratory performs to test the safety and functionality of firearms. To perform this test, they dropped the firearm from 48" on all sides, and checked to see if it still functions and remains undamaged, but more importantly does not fire on impact. The result Success! No cracks, no misfires! Watch The Crush Test Video Here! In this test they took an American Tactical OMNI HYBRID lower and put it to the ultimate test... run it over with a 8,000 lb. forklift tow motor! This test isn't intended as a real world simulation, rather to prove the strength of the zinc alloy metal insert that is contained inside of this reinforced polymer lower. 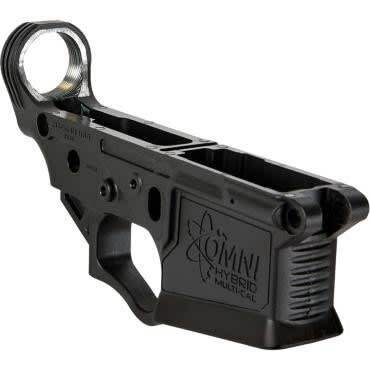 Weighing in at only 1/2 a pound, this 8 ounce OMNI HYBRID lower receiver is lighter than most aluminum lowers, yet has the strength or more of a steel body lower! The result Success! The metal threaded insert was not distorted or broken in any way, and the reinforced polymer survived, and is fully functional! Needless to say, this tough OMNI HYBRID held up to a test we all thought was impossible! American Tactical’s LIMITED LIFETIME WARRANTY is in effect for any firearms registered for warranty beginning January 1, 2015. This warranty extends to any and all parts of the firearm as originally sold by American Tactical, but does not extend to firearms altered after their original purchase, firearms damaged through abuse, misuse or lack of proper care and maintenance or firearms used other than for their legal intended purposes. If a firearm cannot be repaired, American Tactical will replace it with a brand new identical firearm. If a replacement firearm identical to the returned firearm is not available, American Tactical will replace it with a firearm of equal value to be determined at our discretion. The American Tactical LIMITED LIFETIME WARRANTY does not allow for monetary compensation for firearms purchased by the end user at the retail level. Any and all claims for monetary return must be addressed with the retail location from which the end user purchased the American Tactical brand domestic or imported firearm and will be subject to the terms and conditions of the retail locations returns policies. American Tactical is not liable for any returns or claims policies of independent retailers selling American Tactical brand domestic or imported products. All firearms registered prior to January 1, 2015 are still subject to the previous 2 Year American Tactical Warranty policy. Once expired, firearms registered prior to January 1, 2015 will be subject to the policy detailed below in the section labeled SERVICES OUTSIDE OF WARRANTY. It is the policy of American Tactical that any replacement firearm or receiver be transferred via a Federal Firearms Licensed Dealer. Patented Metal Reinforced, Polymer Lower Receiver.The lightness of polymer. The strength of a billet lower. Accepts all AR-15 barrels and standard lower parts.